One of the biggest developments in cycling equipment over the past few years has been the evolution of high-power, rechargeable lighting in a compact size. 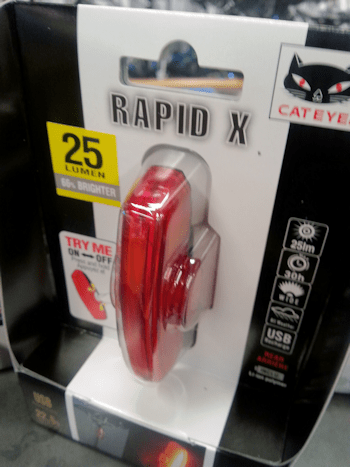 A rear light which has become a favorite with the guys in the shop is the Cateye Rapid-X. 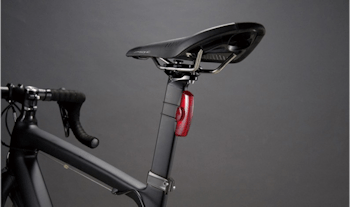 Unlike many rear lights the Rapid-X is easy to fit to an aero seatpost or, if seatpost real-estate is lacking, will readily adapt to a rear seat stay. Also, unlike many lights of this type, the Rapid-X has excellent 180 degree visibility, so maintains conspicuity even from the side. Of course, rechargeable lights do cost more than regular battery lights, but factor in the cost of dozens of Duracell batteries and they don’t seem so expensive. And finally, a bright year light is also useful in the summer and many’s the time when I’ve dived under the tree canopy along a Sourland country lane, listening to a monster SUV bowling up behind and felt some reassurance that, the driver can see me. We have a great stock of these lights as well as other fine lights and electronic accessories by Light & Motion and Blackburn as well as Cateye.